For the last six years York charity organisation ‘Keep your pet’ (KYP) has organised a fundraising dog walk on the Knavesmire, & this is now a firm fixture in dog-owners’ diaries. 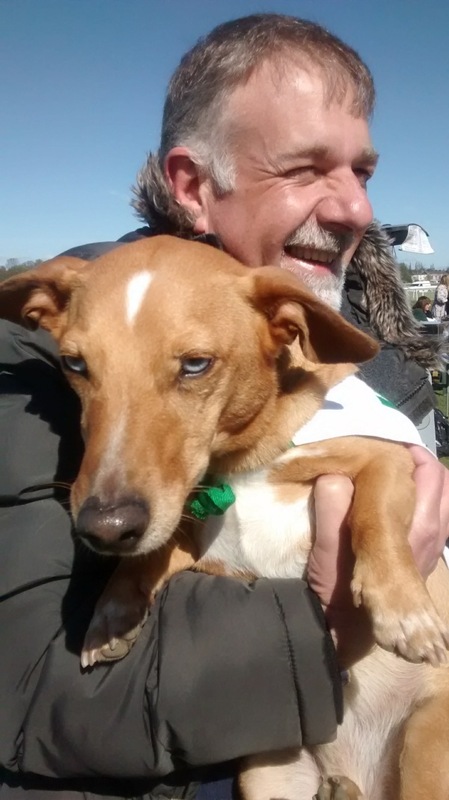 Last year’s event was selected as one of the Lord Mayor’s charities & attracted record numbers, with nearly 150 dogs & owners taking part. The event raised almost £2,000, which was divided between the three Lord Mayor’s charities. Jonathan Cowap of BBC Radio York, famous for his irrepressible enthusiasm, will again be Master of Ceremonies. Jonathan has been a keen supporter of KYP since its launch in 2012 & his help has been invaluable. As in previous years Jonathan, who has no dog of his own, will walk a dog called Henry, with whom he has become firm friends. There will be cakes, savouries & hot drinks on sale, stalls selling books, crafts & toys, competitions including ‘waggiest tail’, ‘sit for a sausage’ & ‘dog most like their owner’, a dog agility course for all comers, spot prizes, a tombola, & live music provided by local group ‘Dynamics’. Walkers can register from 10.15 and there will be events taking place from then until the start at 11am. Entry fee £5.00 per dog or family. The entrance is from Knavesmire Road, near the Racecourse buildings (YO23 1EX). Walkers can do any distance they wish and will be given a completion certificate. 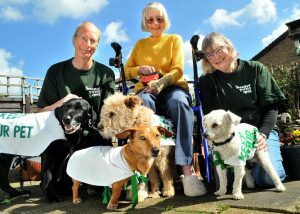 If you’d like to know more about Keep Your Pet, visit the website www.keepyourpet.co.uk or download the KYP poster here. Also take a look at the Purple Pages entry in the Bishopthorpe.net directory here. Service 11 will operate on Easter Saturday only. Service 500 (our normal Sunday service) will run on the other holiday days. Park & Ride services will operate their normal timetable. Note that Service 21 does not operate on Sundays or Sunday timetable days. This is a Heritage Lottery funded project which aims to highlight Bishopthorpe’s orchard heritage and create a new community orchard for the village. The project runs from 1 November 2018 to 31 October 2019. If you have been to Ferry Lane playing field recently you may have noticed that a lot has changed on the community orchard site in the last few weeks! 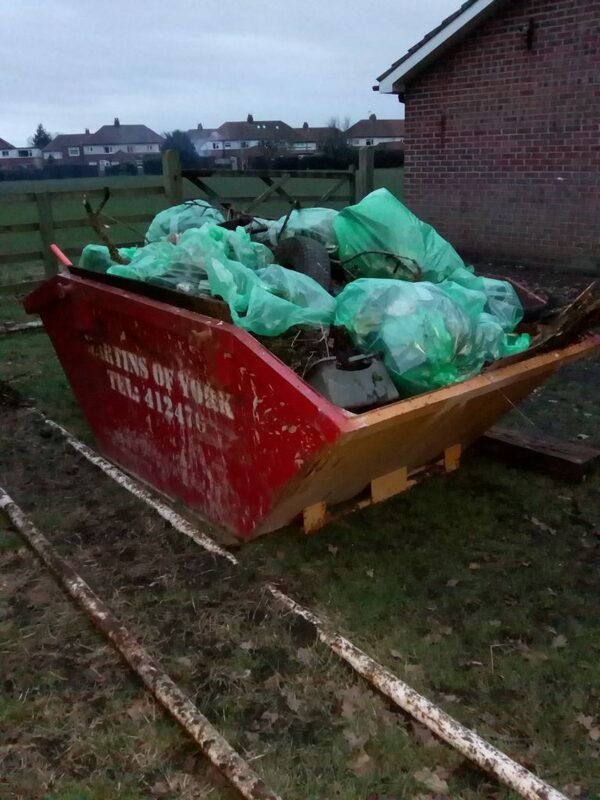 Following the successful litter picking and bramble cutting event at the end of January, Jonathan Short (Ainsty Landscapes) has very kindly dug the site over and rotovated it. Thank you to all the volunteers who came to our second community event and pulled out wheel barrow loads of bramble and nettle roots which had carpeted the area. This summer it will be essential to keep on top of the weeds by regular cutting. If you are able to help with this, especially if you have a ride-on mower, we would love to hear from you. So much progress has been made, that BBC Radio York heard about the project and featured it as one of their secret locations on ‘Finders Keepers’ on Saturday 2nd March. If you missed the programme, it may still be available on the BBC website. It was clue number 4. Fruit tree experts, Tony Chalcraft and Jane Thurlow, have now held 2 training events on fruit tree pruning in gardens in the village. Both events were very popular and took place in contrasting conditions: the first in warm sunshine, the second in rain! We had a go at tackling some old apple trees which had not been pruned for many years. Tony and Jane advised to first cut out the dead and diseased wood, then rubbing branches, and then branches crossing the middle of the tree. The ultimate aim is an open centre to the tree which ‘a robin could fly through.’ There was much discussion, and although some pruning was done, they advised not doing too much in one year because of the risk of ‘shocking the tree’. I think we can all say that, with our newly trained eyes, we now look at fruit trees in a different way! No more pruning events are planned, but if there is enough demand, we may be able to run another event in Bishopthorpe next winter. Our research into the history of orchards in the village is continuing, and if you have any photos or memories of orchards from the ‘old days’ please do get in touch. We would also like to hear about the locations of any old fruit trees in the village. For more information about the project, including the newsletter and forthcoming events, use the ‘orchard’ tag on www.bishopthorpe.net. To contact the project please email bishorchard@yahoo.com or phone 07563 798408. 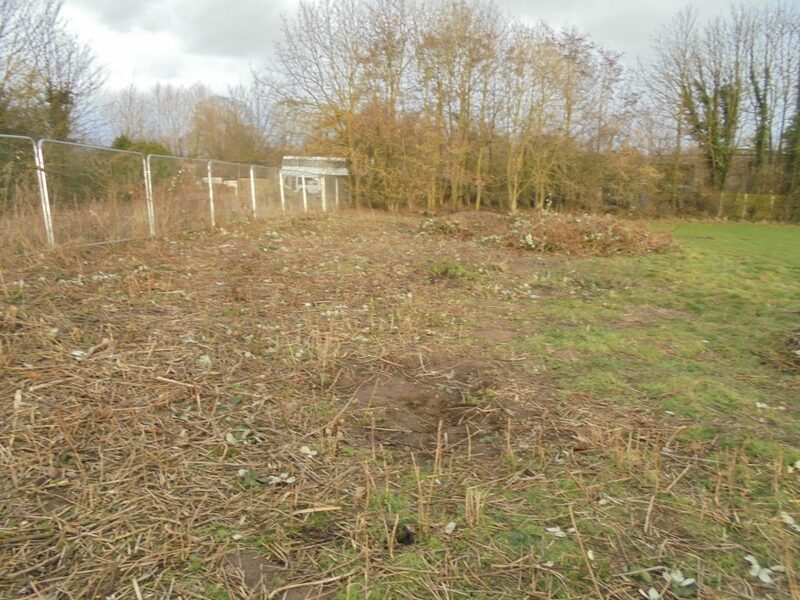 At the end of January we made a big step forward in our plans to create a Community Orchard on derelict land on the edge of the Ferry Lane playing field. Over 40 people came along on a Saturday afternoon to help, over half of whom were children. Particular thanks go to the 1st Bishopthorpe Scouts, White Rose Football Club and their families who all worked so hard. We filled a skip with all the rubbish and made a big pile of rusty metal which went for recycling. A huge metal goal post, which had lain embedded in the ground for many years, was pulled out in a real team effort! There was so much enthusiasm for the task, that all the brambles were cleared too, which means we don’t need to pay for a tractor and flail! The next stage is to get the site levelled and reseeded with grasses and wildflowers this spring. There is one more fruit tree pruning training event coming up on Sunday 3 March, 2pm to 4pm, led by fruit tree experts, Tony Chalcraft and Jane Thurlow. This will be held in a garden on Copmanthorpe Lane. There will be a brief indoor session followed by a demonstration of the basics of pruning, with the opportunity to have a go yourself. The event is free but booking is required as numbers are limited. Have you ever wondered how to prune your fruit tree, but are worried about getting it wrong? Pruning helps improve tree health and promote better fruit production, but it can be daunting knowing where to start! Fruit tree experts, Tony Chalcraft and Jane Thurlow are here to help. They are running 2 practical training events in Bishopthorpe, the first in the Vicarage garden and the second in a garden on Copmanthorpe Lane. There will be a brief indoor session followed by a demonstration of the basics of pruning, with the opportunity to have a go yourself. These are sure to be informative and enjoyable events. The events are free but booking is required as numbers are limited. The dates are: Saturday 16 February, 2pm to 4pm and Sunday 3 March, 2pm to 4pm (weather permitting). Many thanks to all the volunteers who are helping clear rubbish from the new community orchard site on the edge of Ferry Lane playing field. The area is due to be cut with a tractor and flail in February. The work will be done before the bird nesting season starts, and a check will be made for any hibernating hedgehogs. At the end of November, Tony Chalcraft and Jane Thurlow, York fruit tree experts, gave a very informative and well attended talk at Vernon House called ‘Know and Love your Fruit trees.’ We learnt that pruning is not essential but is good for increasing fruit production and reducing disease. We heard that the aim is a ‘goblet’ shape to the tree, and ‘lop and top’ should be avoided! We also had the opportunity to sample some delicious varieties of apples. For anyone who wants to learn how to prune their own trees, Tony and Jane will be running 2 hour practical training events in Bishopthorpe in February/March. In January we are turning our attention to the proposed community orchard site on the edge of Ferry Lane playing field. 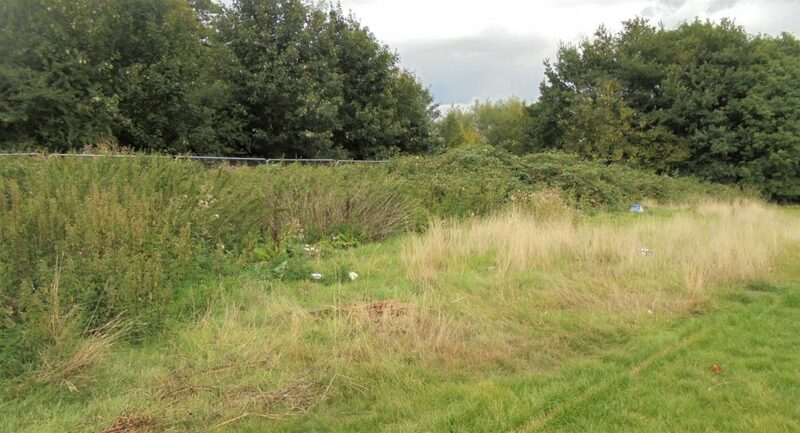 The area is overgrown and rubbish needs removing before the brambles can be cut with a tractor and flail. We are holding a litter picking event there on Saturday 26 January from 2pm to 4pm. We have been promised help from Bishopthorpe Scouts and the White Rose Football Club, and additional adults and children will be welcome. We will have litter pickers, bags, and a skip to fill. Just remember to bring gloves and stout shoes! If we have enough volunteers we can litter pick around the playing field, and clear the woodland of rubbish too! Fruit tree surveys are continuing throughout the year so please let us know of any trees you would like us to survey. We are particularly interested to know if any old fruit trees remain in The Coppice and The Orchard. Homeshare York is a new service that may be of interest to people in the Bishopthorpe area – particularly older residents who may be experiencing loneliness and isolation, or could benefit from some practical help around the house. Homeshare is being rolled out in conjunction with City of York Council, and is based on a national model that matches an older homeowner with a younger person in a homesharing arrangement for mutual benefit. In return for a room in their home, a sharer will provide 10 hours a week of support and/or companionship to the householder. 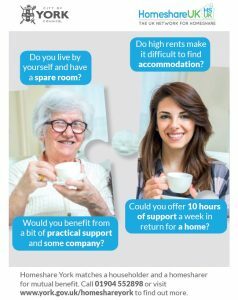 Homeshare gives an older person the opportunity to continue living independently with the support and companionship of a sharer, whilst also providing a solution to young professionals or mature students in need of affordable accommodation. In addition to resolving these practical issues, Homeshare matches often result in other benefits linked to intergenerational friendships. In similar services across the UK, participants have experienced reduced isolation, increased wellbeing and the opportunity to learn new skills. Homeshare York is a not-for-profit service, with a monthly contribution made by the Householder and Homesharer to cover the cost of the matching process and ongoing support. 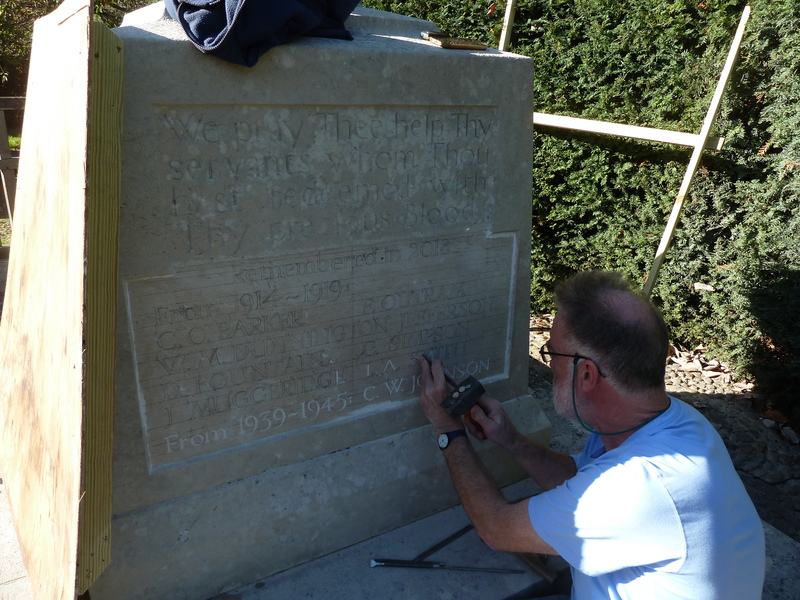 Ken Haywood’s book telling the stories of the men who are commemorated on Bishopthorpe’s War Memorial was published in November, 2017. 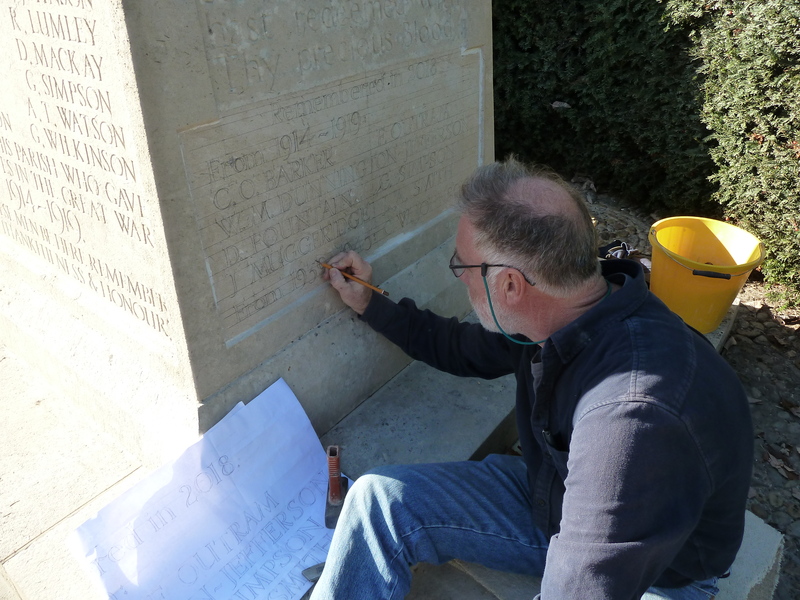 In the process of completing the research on the men, Ken became aware of a number of other Bishopthorpe men from both wars who died as a result of service with the Forces but who were not commemorated on the village memorial. 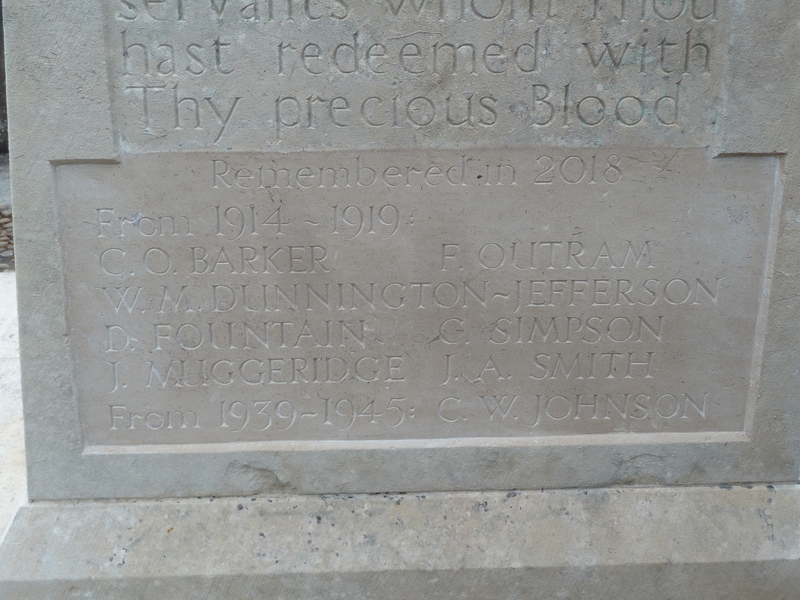 However, as a result of the publication of ‘The Lost Men of Bishopthorpe’, the Parish Council committed to adding the additional names to the War Memorial by the time of the centenary of the end of the First World War in November last year. 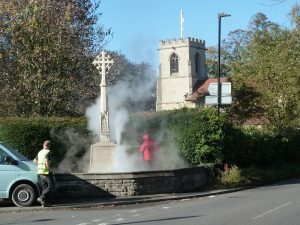 The work took place in the second part of October, 2018, and the work was completed in time for Remembrance Sunday on the 11th November. 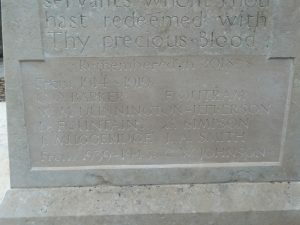 The following photographs were taken while the memorial was being cleaned and the names added. Bishopthorpe’s War Memorial is cleaned by high pressure water jet on the 18th October, 2018. Stonemason Tim Davies pencils in the additional names on 22nd October, 2018. Tim starts to carve out the additional names on the memorial. The completed panel of new names. On the 31st October, 2018, Parish Council Chairman Stewart Harrison watches Tim Davies complete the final touches to the Memorial. On Monday the 18th March, 2019, the Friends of Bishopthorpe Library are hosting a talk by Ken. He will describe how he found the stories of the men of Bishopthorpe who did not return from service in the First World War. Using examples from his book in an illustrated presentation, Ken will show how to research your own military family history. The Number 11 is as normal from Bishopthorpe through town as far as Ousegate. Thereafter, it goes past the magistrates’ court and the old fire station, turns left beyond Clifford’s Tower and continues past the Barbican to the Lawrence St. traffic lights where it turns right. At the next lights it turns left along James Street until it regains its normal route to Heworth and Ashley Park. It returns to town the same way. Evening services that would normally terminate at Stonebow now do the Barbican/Fishergate loop and return to pick up the ‘normal’ route from Clifford Street/Ouse Bridge. There are temporary stops on both sides of the road by the magistrates’ court and at each end of James Street. The second of the James St. stops is reasonably convenient for Morrisons’ supermarket. First York ask that passengers intending to board or to leave the bus at the temporary stops should signal to the driver clearly and early. Eborienteers organise regular events in and around York and North Yorkshire. This year, the club’s 50th anniversary year, for the first time we are using the streets and fields of Bishopthorpe for an event. The club has spent some time developing a new map especially for this event. The club would very much like to invite and encourage Bishopthorpe folks to come and take part. We will welcome all ages and fitness levels, and there will club members on hand to explain and assist for anyone new to orienteering. There will be a number of courses available from 1-5k that are suitable for newcomers and children, people who would like a change from their usual run, and of course more technical courses for experience orienteers. The centre of operations will be at the Riverside Caravan Park, Ferry Ln, Bishopthorpe, York YO23 2SB and we will be using Bishopthorpe’s residential streets, school grounds and riverside fields. For the one entry fee (Seniors £5.00; Juniors £2.50), you can try as many of the courses as you wish. If you want to know more about this event please do contact the event organiser Simon Brook (simon.brook@lineone.net). For more information about orienteering the check out the club website at eborienteers.org.uk. 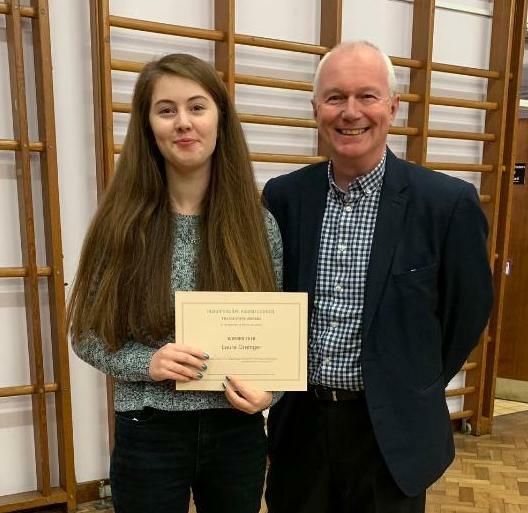 The winner of the Bishopthorpe Parish Council Youth Award for 2018 is Laura Grainger. Here she is, being presented with her award (and £150) by Parish Council Chairman Stewart Harrison. Laura has been helping at Rainbows in the village for over 3 years and has always been reliable and enthusiastic. She has grown in experience and inputs to planning meetings with fully researched ideas to enhance the overall enjoyment of the young Rainbows. She follows these ideas through from the planning meetings to take responsibility for preparing and carrying out the activities in the weekly meetings. The leaders of Rainbows enjoy working with Laura and consider her to be a conscientious and hardworking member of the team and emphasise that the young girls love that Laura is prepared to listen to and encourage them to join in the fun. The Bishopthorpe Parish Council Youth Award has been presented each year since 2002 and winners have been recognised as young people who contribute their time and effort over a long period, not realising the contribution they are no doubt making to village life. Previous winners have been recognised for working with both young and elderly people, working within the church, schools, sports clubs or organisations and working both in the village and the wider world. Fruit tree experts Tony Chalcraft and Jane Thurlow will be leading these events in support of the Community Orchard project. Come along and find out how to improve the health and productivity of your fruit trees. At each event there will be a brief indoor session followed by a demonstration of the basics of pruning, with the opportunity to have a go yourself. The events are free but please book as numbers are limited. 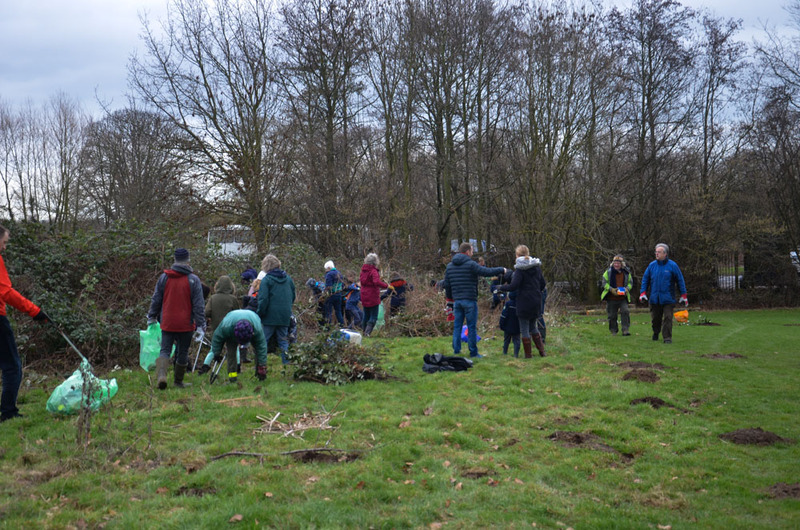 On Saturday 26 January we made a big step forward in our plans to create the Community Orchard. Over 40 people came along to help clear up the derelict land on the edge of the Ferry Lane playing field. Over half of them were children, including twelve Bishopthorpe Scouts. There was so much enthusiasm for the task that all the brambles were cleared too, which means we don’t need to pay for a tractor and flail. This is what we removed. Bishy Road – 150 years of our local shopping street. ‘A very very very fine house’: researching family and house history in Wentworth Road. Admission is £3 to non members, and all are welcome. Refreshments will be available to buy.